For months, rumors have indicated the upcoming "iPhone 6s" may be slightly thicker and larger than its predecessor, likely due to several factors including a change in the aluminum being used for the shell, thickening of weak spots in the case to help address concerns over bending, and new support for Force Touch functionality in the display. The size increase is expected to be only a fraction of a millimeter in each dimension, making it virtually unnoticeable to users and allowing most iPhone 6 accessories to continue to work with the iPhone 6s. MacRumors has now received several photos showing an iPhone 6s assembled from parts, allowing full measurements of the device to be taken. 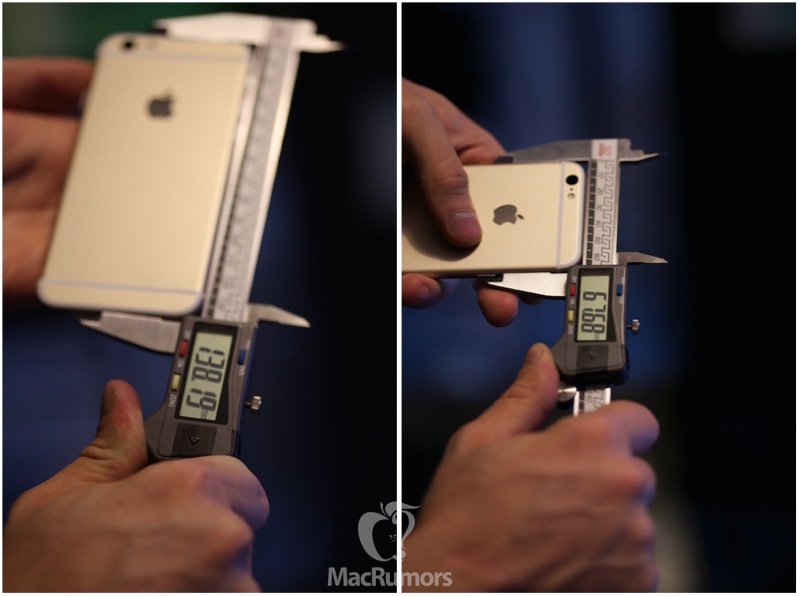 Of most interest has been the thickness of the device, and photos show the iPhone 6s measuring 7.08 mm thick compared to Apple's official measurement of 6.9 mm on the iPhone 6. This is in line with previous rumors claiming that each of the new models will be roughly 0.2 mm thicker than the current iPhones, with the iPhone 6s Plus moving to 7.3 mm thick from 7.1 mm. The new photos also reveal slight increases for the height and width of the iPhone 6s, with the device measuring 138.19 mm tall and 67.68 mm wide, compared to 138.1 mm and 67.0 mm for the corresponding measurements on the iPhone 6. Since the height and width of the device are determined solely by the rear shell, we can also compare these measurements to those taken by Unbox Therapy last month. Those measurements came in at 138.26 mm tall and 67.16 mm wide. 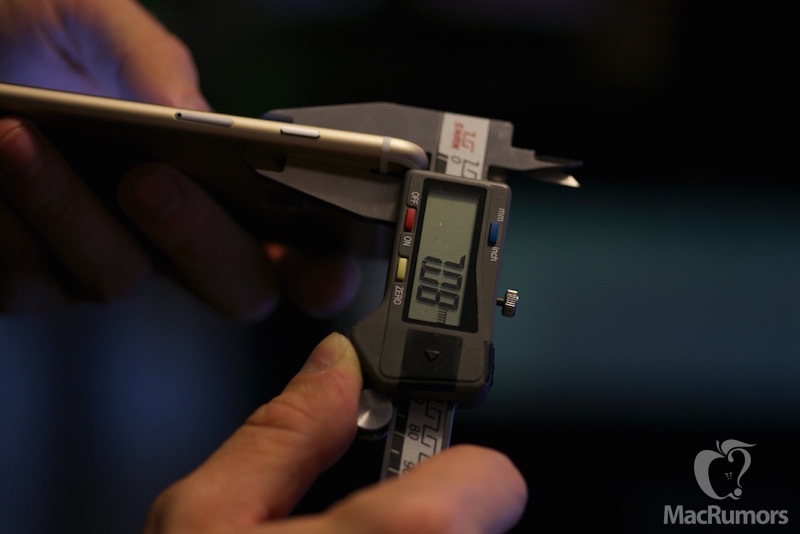 KGI Securities analyst Ming-Chi Kuo had predicted as early as mid-June that the iPhone 6s could be roughly 0.15 mm taller and wider and 0.2 mm thicker than the iPhone 6, and while there is some variability in measurements likely due in large part to the relatively low quality digital calipers being used for measurements, they do suggest there may indeed be a slight increase in each dimension. On a percentage basis, the thickness would see the biggest increase of nearly 3 percent, matching the iPhone 6 Plus thickness. That increase could be enough to prevent some tight-fitting iPhone 6 cases from fitting the 6s, but many cases should have enough wiggle room to accommodate the new models. Case makers such as Spigen are already announcing cases designed specifically for the iPhone 6s and iPhone 6s Plus, suggesting they are confident in rumors and leaks pointing toward slight size changes, and making early announcements of cases specific to the new models gives the company some additional marketing buzz headed into the release. Apple will introduce the iPhone 6s and 6s Plus at a media event scheduled for next Wednesday, September 9, an event that is becoming increasingly jam-packed amid reports of unveilings of a new Apple TV, the long-rumored iPad Pro, and a thinner iPad mini 4. Apple Watch tidbits such as new Sport Band color options and final looks at iOS 9 and watchOS 2 before their public launches are also likely to be included. thicker?! ever since Jony stepped back, we're seeing some light shining on us. Honestly I would welcome a slightly thicker iPhone. I have the iPhone 6 and ended up buying a case more to provide a bit more heft to the device than anything else. Absent the case my iPhone is extremely thin and feels somewhat fragile. The back while aesthetically pleasing is also incredibly smooth, making a phone slip terrifyingly easy. I know everyone wants thinner and bigger but man... there is a point where you see diminishing returns on that want. 0.2mm thicker. It takes micrometer to tell the difference. Too bad they won't make phones 1.0mm thicker and fill that space with extra battery. 0.2 mm thicker? Apple is really slipping of late. Jobs would never have allowed this. Wait - forgot to zero the calipers. Never mind. That's funny, my wife told me the same thing.